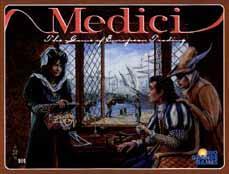 Medici , Reiner Knizia, Amigo/Rio Grande Games, 1995/1998. Categories: board, family, cards, auctions, bidding. Medici is a balanced and well-designed card game of bluffing and bidding. What I admire most about the game is the finely crafted scoring system, in which each option is carefully balanced against other options. At any point in the game there is always the excrutiating decision of pursuing one strategy or the other, and then realizing the nearly equal value of each decision. The mental wheels turn and the excitement mounts as each card is revealed to determine the value of the cargo. Bids are calculated to force the other players to waste money, and yet there is always the danger that others will pass and force you to expend your bid. There are 36 cards in the deck, five suits of 7 cards each representing a trading commodity of the middle ages: spices, fur, cloth, dyes, and grain. Each suit has cards with values 0 through 4 and two cards with value 5. One last card represents a gold shipment and has a value of 10. During a turn a player reveals 1, 2, or 3 cards from the deck, and each player gets one chance to bid on the cards as a group. The "once-around" bid begins with the player to the left of the revealer and ends with the revealer. The high bidder gets the set or else the set is tossed in the sea and discarded. When all cards have been auctioned or everyone has five cards, then the round is ended and scored. Three rounds make a game. Like many Reiner Knizia games, emphasizing one scoring method at the exclusion of others will score you less points than another player who juggles multiple scoring methods. A person who exclusively goes for the highest sum often places poorly on the pyramid tracks. Similarly, one who goes for a monopoly in one or two suits places behind one who can win a suit or two AND score a high sum. Of course, one who recklessly bids for cards falls behind in the ranking, but one who is frugal and able to nab some points usually is successful in the game. There are numerous important strategical decisions to be made. During a round, the person who reveals the cards has the most power. First of all, this person decides the size of the set of revealed cards. Since each bidder is limited to owning 5 cards, the revealer can shut out players from the bidding by choosing a set of cards larger than a bidder can handle. Players with 3 cards in the hold cannot bid on 3 card sets; players with 4 cards in the hold cannot bid on 2 or 3 card sets; players with 5 cards in the hold cannot bid at all. Secondly, during the once-around bidding, the revealer is the last person to bid and thus has the final choice on whether to own or ignore a card set. Finally, the revealer gets to turn the card set over one at time and can control the value of a card set for any player. For instance, if one bidder needs red cards and the first card revealed is the lucrative red 5, the revealer can "junk up" this card set by turning over another card. A green 0 paired with the red 5 may be an undesirable set -- a poison pill to go with your caviar. Similarly, assuming the first card is a blue 0, the revealer can turn over another card, say a yellow 5, and suddenly make the set more palatable. Sometimes these card sets are excrutiatingly difficult to assess. Another set of excrutiating decisions comes in the bidding. Each bid must be made to force other players to invest heavily, but a bid must not be so outrageous as to force one to eat their own folly. For instance, assume one player needs a few green cards and reveals two green 5s. Everyone knows the revealer gets the last shot at the two 5s, but it is now up to the other players to force this bidder to pay a high price. If you don't want the cards you must not simply pass, because this allows the revealer to pick up the two valuable cards for little money. Instead, depending on the point in the game and the positions on the score tracks, you must bid in the vicinity of 10 to 15 points to force the revealer to pay high. Assuming these cards allow a person to scoop up the 30 point first place sum score, you may bid 30 or more points to really make this a tough decision. A battle of the bids. Excellent. Card counting comes in handy. In the six player game, all 36 cards are used. This allows everyone 5 cards for their hold and one card each for discarding in the ocean. If you keep track of which cards remain in the deck, you get a better idea of how likely it is to turn over that gold 10 card you need. With less than 6 players, a proportionate amount of cards are discarded unseen at the start of each round. (In fact the formula is 6 cards for each player: 18 cards for 3 players, 24 cards for 4 players, etc.) This makes card counting less useful as you are never sure if the card you need remains in the deck or in this round's discard pile. And now a few words on the production values of the game. Rio Grande Games goofed on this one. The cards are stiff and small and extremely difficult to shuffle. If I had my way, there would be a law that cards must be Bridge-sized and textured like the cards in Elfenland to assure easy shuffling. Second, the graphic design on the cards is somewhat difficult to read. The numbers should have been made larger, higher-contrast, and visible from each side of the card. The commodity names are difficult to read and the cloth and dye cards are too similar to rapidly distinguish. Finally, the biggest goof is the pyramidal score track design: there is no color to associate a pyramid with a given suit. I took out my Citadel paints and painted a colored background behind the pyramid. Game collectors will cringe that this destoys the resale value of the game, but to heck with that, I play my games and this color scheme is necessary to associate the scores quickly. Another nit to pick is the theme. It is completely superfluous to the game! Essentially, this is an abstract card game with pretty pictures on the cards and a specialized score track. Players looking for some sort of thematic feast or immersion into Renaissance trading need not apply. Nevertheless, I prefer some nice artwork along with the numbers, and not just a purely abstract board and cards. Graphic problems and nitpicking aside, Medici is an excellent game -- simple enough to explain and play in an hour, sophisticated enough to replay with many gaming groups. The scoring system is so well balanced that each game presents many different options: do you go for the big sum score or do you trounce your opponents with spices? The game is light enough that it makes an excellent vehicle for introducing card players to the German gaming genre. Although this is essentially a simple abstract card game, I would recommend a copy for any well-stocked game closet. [an error occurred while processing this directive] Last modified: Thursday, 09-Jun-2011 12:36:53 MST.